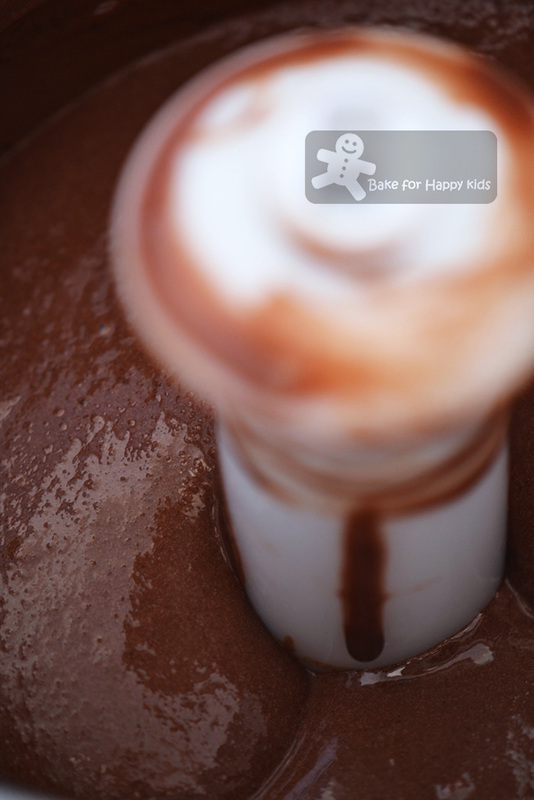 Bake for Happy Kids: Rich Fudgy Chocolate Ice Cream - NOT OILY and has NO eggs in it!!! 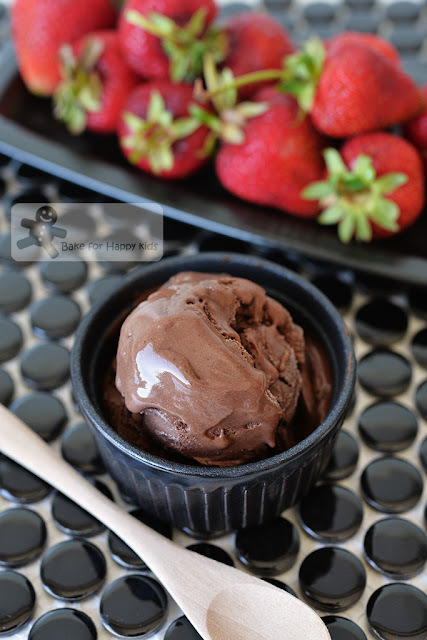 Rich Fudgy Chocolate Ice Cream - NOT OILY and has NO eggs in it!!! Amazingly, it is not oily to taste and has no eggs in it! "It's official! This is now my favourite chocolate ice cream!" said my fussy husband when he and my son shared a cup of this yummy ice cream. Knowing that my husband is REAL fussy, I have to say that I'm a little shocked hearing his compliment but at least I know that he is not faking. LOL! "It is rich, fudgy, smooth and yet not oily at all!!!" my husband continued praising the ice cream as he was washing the cup that he used to contain his ice cream. "See! Washing this cup is easy!!! It's not greasy!!!" "You may wish to know there is NO eggs and egg yolks in this ice cream and it is made with moderate amount of cream." I felt proud that I made this ice cream and tried to explain how I made it. "Did you lie to us? Did you add egg yolks in this ice cream?" My husband was still thinking about this ice cream... LOL! "We want you to make rich chocolate ice cream!" said my husband and son. "Are you sure that you want me to make very rich chocolate ice cream?" I asked. "There is quite a lot of egg yolks and cream in it"
Ironically, no one said anything!!! Then I thought... Maybe I wasn't Googling enough. With more research and reading, I eventually found this really good chocolate ice cream recipe made by David Lebovitz. According David, this ice cream recipe originates from the book, Jeni’s Splendid Ice Creams at Home by Jeni Britton Bauer. Jeni is the founder of the famous Jeni’s Splendid Ice Creams in Ohio. "Oh! I know this name!!!" I said to myself! Although I have not been to Ohio and have not try Jeni's ice cream before, I have heard many praises of Jeni's ice cream and also her book. First, I made this cornflour-and-milk mixture and this will be our ice cream thickener. ... sugar and corn syrup into a large saucepan. 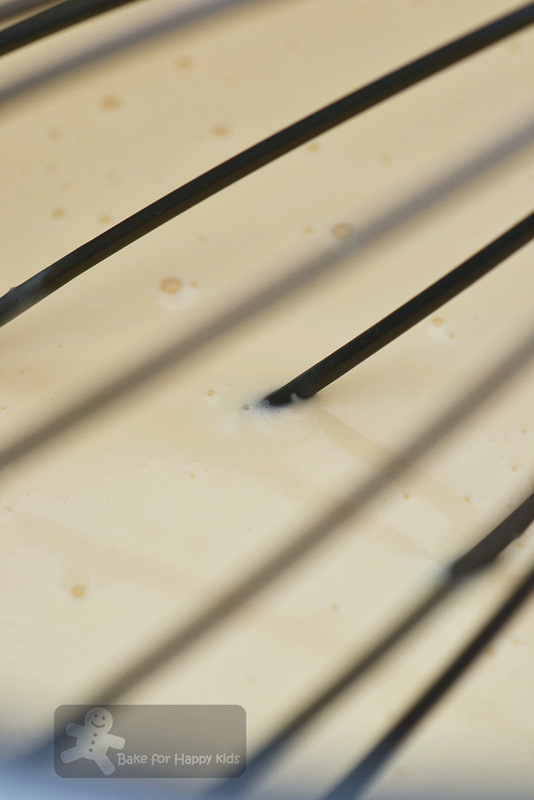 Whisk and cook the mixture until it comes to a moderate boil. 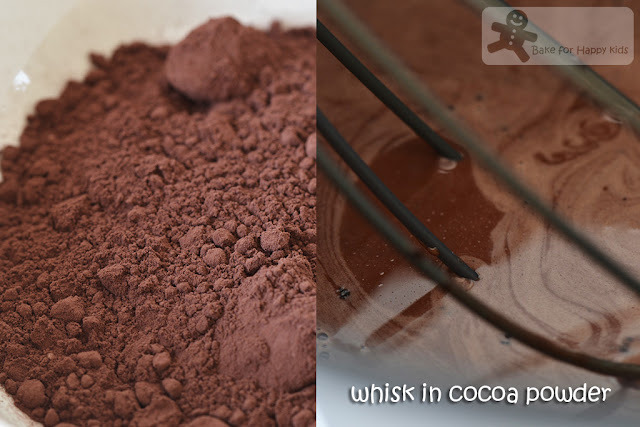 To dissolve the cocoa powder fully, whisk and cook the mixture further for about 4 mins. Then, add cornflour mixture and continue to whisk and cook for 1 min or until it is slightly thickened. 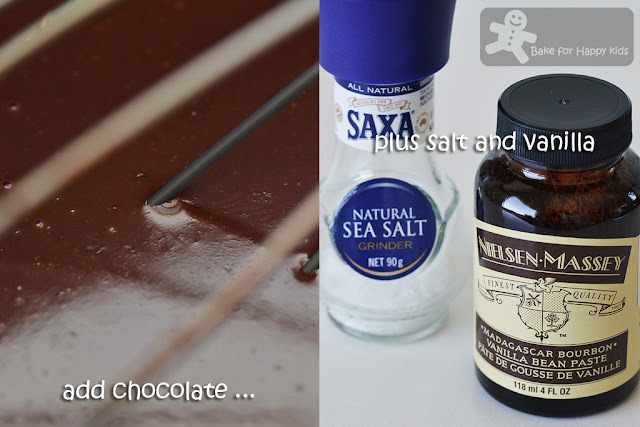 Remove the saucepan from the heat and then stir in chocolate, salt and vanilla. This is the quick chill technique that Jeni used to minimise the amount of ice forming in her ice cream! And this is what I did to chill the mixture immediately. Do not take short cut by leaving the ice cream mixture to chill in the fridge on its own as it will form a jelly-like mixture and this will cause the ice cream to be icy! See how rich and smooth this ice cream! Yeah... I'm going to lick this bowl after I took this pic... keke! "... Did you add egg yolks in this ice cream?" "You have to trust me. I didn't add any egg yolks in this ice cream. It was thickened by cornflour!" Then I can see my husband looked sort of convinced as he asked "Can you make more of this ice cream?" Update on 30 Jan 2017: I have not been looking around!!! ... because I know that this is THE chocolate ice cream recipe to make whenever my family asks for chocolate ice cream! Yes... This is our favourite and the best!!! And here's a video showing how I made this yummy ice cream again. So smooth, rich and fudgy but not oily!!! 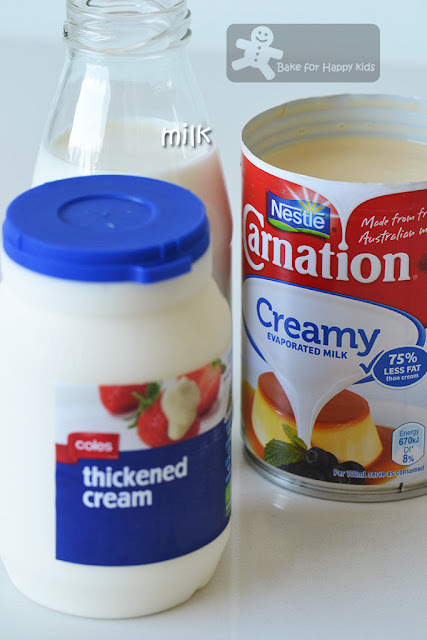 *To minimise wastage, I have tried using the whole can (375ml) instead of 1 cup (250ml) evaporated milk to make my subsequent ice cream and it works well for me too. 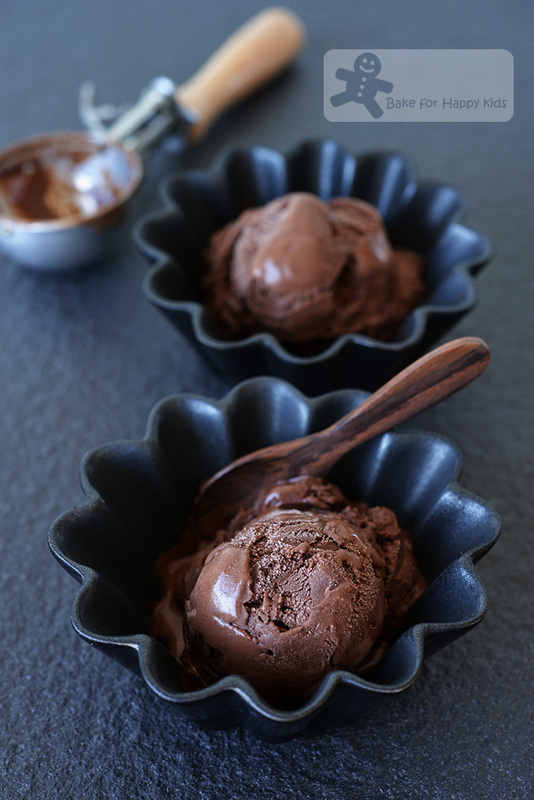 Although the additional evaporated milk makes the ice cream less rich in its chocolate flavour, less fudgy in its texture and less sweet in its taste, it is surprisingly as creamy and satisfying as the original ice cream. Place cornflour in a small bowl. 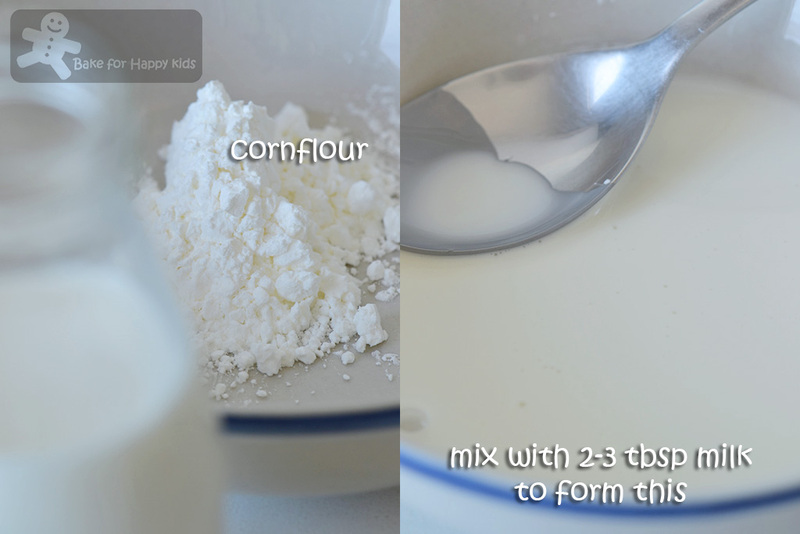 Add 2-3 tbsp of the milk mix until mixture forms a smooth slurry. 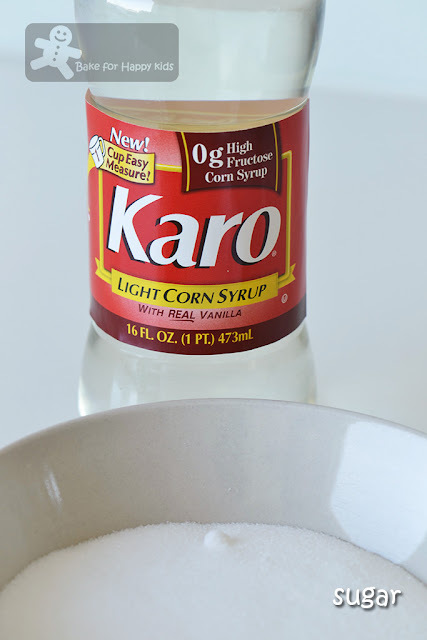 In large saucepan, heat the rest of the milk, cream, evaporated milk, sugar, and corn syrup until mixture comes to a moderate boil. Whisk in the cocoa powder, then let mixture cook at a modest boil for 4 mins. Then, whisk in the cornflour mixture and continue to cook and whisk for one min until slightly thickened. Important: Do not over-cook the mixture! 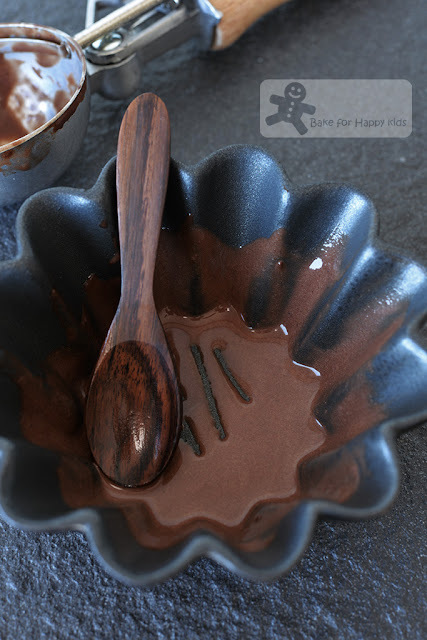 Remove from heat and add the chopped chocolate and salt, stirring until the chocolate is completely melted and the mixture is smooth. Stir in the vanilla. 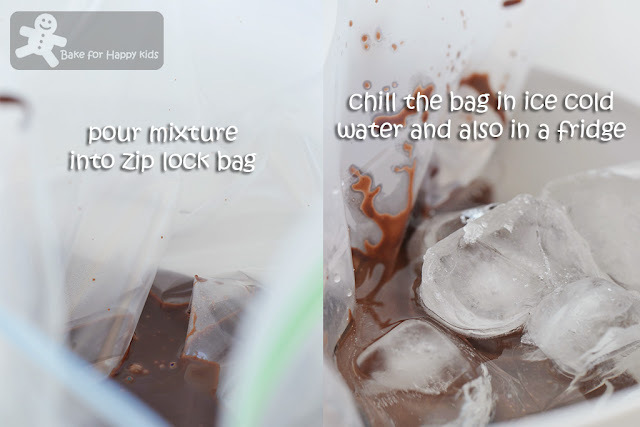 Transfer the ice cream mixture into a zip lock plastic bag. Using zip lock bag to cool the ice cream mixture help to increase a larger surface area to chill. Pour the ice cold water and add ice in a large mixture bowl or if you didn't prepare the cold water in advance, you can prepared a bowl of water filled with a lot more ice. Submerge the bag into the bowl of cold water and allow mixture to cool in the fridge for 30 mins. Important: Do not chill the mixture for too long as the mixture will become jelly-like after prolong time of chilling! You can do this in room temperature but you have to keep adding ice during this cooling period. At the last 5-10 mins of cooling step, start setting up your ice cream maker. Remove the bag from the cold water and wipe off any excess water. Pour the mixture into the canister of an ice cream maker, squeezing every single drop of this ice cream mixture from the zip lock bag, then freeze according to the manufacturer’s instructions. When it is ready, transfer ice cream into a container and continue to freeze ice cream until firm. Enjoy this "our officially best chocolate" ice cream! Happy Easter! Eggless ice cream, I like.. Not so "nau".. At 1 time, everyone was talking abou the frozen fruit ice cream.. Freeze your fruits (especially bananas), blend it, mix with Nutella or peanut butter, and you get a smooth ice cream texture, and noone knows it's NOT ice cream, just frozen bananas..
Ha ha Zoe, the first thought that came to me when I look at your last picture was "I am going to lick the bowl clean" and that's what you said too! Have a great day! This ice cream is the best if it is churned with ice cream maker. 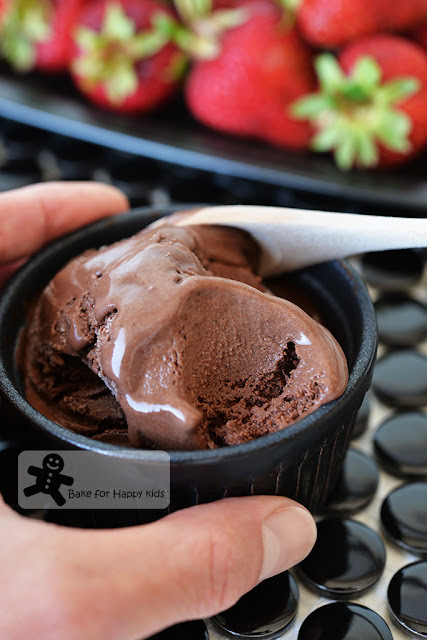 However, if ice cream maker is not available, as suggested by Taste.com.au, you can churn ice cream by pouring the mixture into a shallow container and freeze for 2 hours until frozen at the edges. Beat with electric beaters, then return to freezer. Repeat 2-3 times, then freeze until firm. Have fun making this ice cream. I promise you it is really yummy!!! Hi Zoe, thank you so much for replying. Noted on the tip you gave me and I would so love to try it! Your photos look amazing and I love reading your food blog :) Blessed Easter! Zoe, very impressive! This is obviously a healthier alternative, so I want double helpings hee..hee.. The weather is hot here ... ice cream is just what I need too ... chocolaty & creamy, yum! I have a huge soft spot for chocolate ice cream! I can't think of the last time I had any though because of the egg factor. Since this ice cream doesn't contain eggs and you have provided an alternative to no churning, I see the light and may just splurge and whip up some for special occasions! From photo can tell that the ice cream looks very creamy delicious. I always wanted to make my own ice creams. But I kinda lazy... get straight from hypermarkets easy. Or else drop by to the nearest BR. Zoe, wish you and your family have a great weekend. Thickened by cornflour? Now, that is interesting! It sure looks yummy, Zoe! 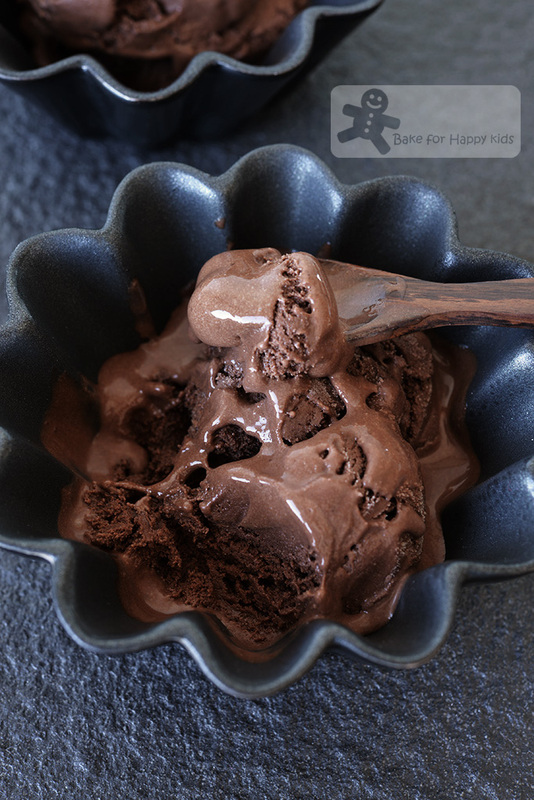 I am sooo drooling over your super rich chocolate ice cream, so creamy rich and intoxicatingly delicious!